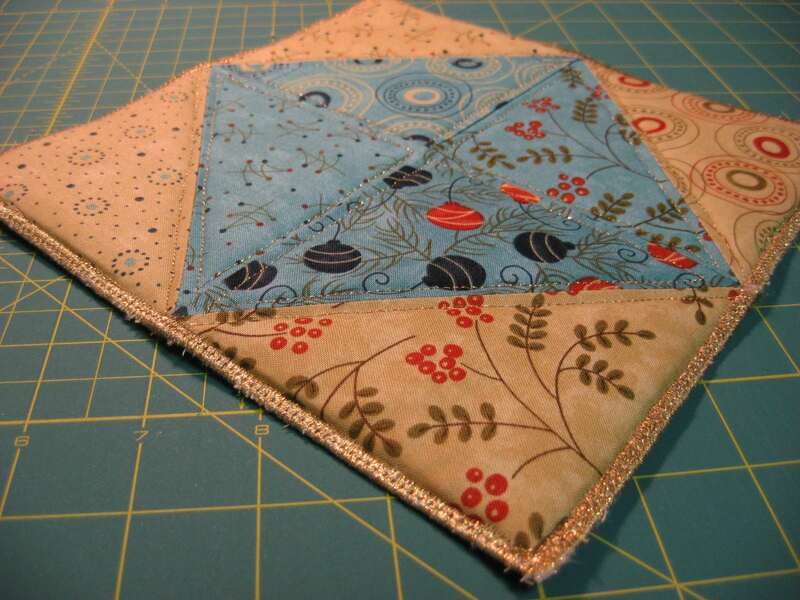 When I made my first candle mat recently, following Sandi's instructions, I ended up with some extra pieced blocks. That is because the instructions will make two mats, but I only made one using the Adoring fabric line. So I thought of something useful to do with the extra blocks that would be pretty as well. Oh yes, and don't forget super easy! ...then pieced four solid charms from the Adoring charm pack and used that for the backing. I did a very tight zig zag stitch twice around the outside edge, the first time just a little narrower than the second time, and using the gold thread in both the top and the bobbin, to seal the edges. And there you have a very festive insulated hot pad that would look pretty on any Christmas table. 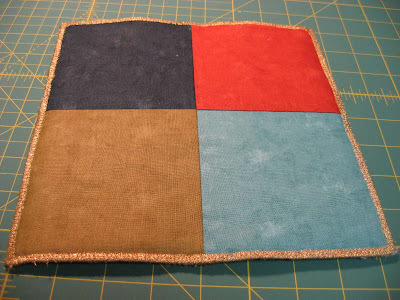 I suppose it could even be used as a small candle mat. The rest of the Adoring charm pack was used for my Advent Calendar Christmas Tree which you can see HERE. 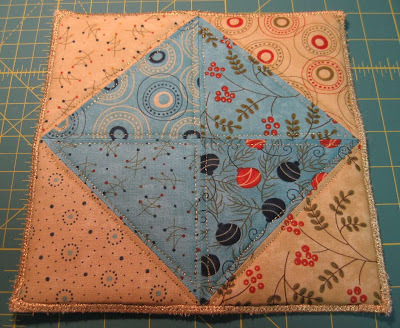 I love picking out different colorways of the same fabric line to use in different projects. 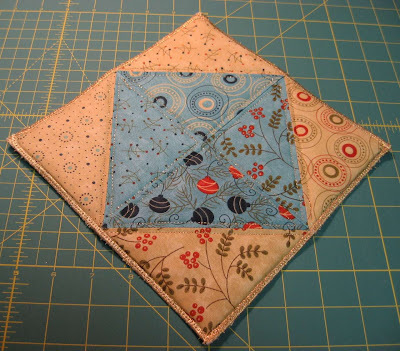 The blues lent themselves so nicely to the candle mat project and I did not use any of the greens for that project. And for the Advent Calendar, I chose the greens, reds, dark blues and just two tans for the tree trunk. And interestingly, my word verification letters are "OVENZ". I wish I had two ovens in my kitchen instead of one! LOL! Good thinking. It's pretty and functional. Coasters are another good idea.